D. 28 Jul 1598 at Ref. 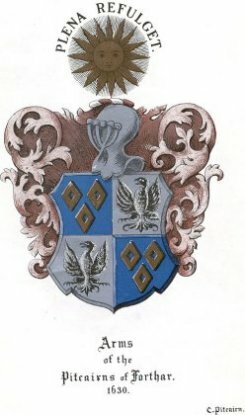 Henry Pitcairn, fifteenth laird of the barony of Forthar and of Pitcairn &c of the barony of Dounfield, of Freuchy and of Dovan, &c. Commendator of Dunfermline, succeeded his father, John Pitcairn in 1593. On John’s marriage 1586 his father, John, who was alive at the time, infefted Isabella, as Henry’s affianced spouse, in the life rent of the lands of Easter Gellet, in the regality of Dunfermline and shire of Fife. On the 26th of Dec. there is a Charter of Sale by Henry Pitcairn of that Ilk, with consent of Isabella Balfour his spouse, and his brother-german Robert Pitcairn of Dounfield, of the lands of Easter Gellet in the regality of Dunfermline. Dated at Forthar: witnesses, David Pitcairn burgess of Dunfermline; James Pitcairn, son of the said Henry Pitcairn &c.
Henry probably bought back the lands of Dounfield from his brother Robert, in exchange for the lands of Easter Gellet, which he sold to him the year before. At any rate Henry was possessed now o the lands of Dounfield, for he willed them later to David, his son, who succeeded him, and David in turn willed them to William his eldest son. Notwithstanding a Royal grant, instead of his nephew Henry succeeding Robert Pitcairn in the abbacy as Abbot, Patrick Gray, Master of Gray, who married Robert Pitcairn’s widow, became Commendator. In 1609 Feb.23 Henry Pitcairn of tht Ilk, David and James his lawful sons,, are witnesses to a charter by John Paterson of Hiltarvet. And the next year 1610, on December 16th Henry sells, with the consent of Isabella Balfour his spouse, to his brother-german Robert Pitcairne of Downfield the lands of Easter Gellet in the regality of Dunfermline. Signed at Forthar, the witnesses being David Pitcairn, burgess of Dunfermline, James Pitcairn, son of the said Henry Pitcairne.